Yesterday, 18 years old Ukranian Fedir Samoilov, became the first Ukranian climber to clip the chains of a 9a. He succeed in Martin Krpan, the hardest route in the right part of Mišja peč. It is the 11th ascent of the route after first ascent done by strong Slovenian Jure Golob back in 2001. The futuristic line was bolted in the nineties of course by Tadej Slabe. It is about 60 moves long power endurance route without any proper rests. It starts in the first part of Strelovod (8c) and finishes almost through the whole of Konec mira (8c/c+). Martin Krpan is a fictional character from the short story written by Fran Levstik back in 1858. A smuggler by profession, he makes a living by illegally transporting English salt. With the help of his loyal, diminutive mare, he carries the salt from the Adriatic Sea coast to the Slovene Lands and elsewhere in Inner Austria. On one of his travels, Krpan meets the imperial carriage on a snowbound road, and makes way for it by picking up his laden horse and moving it aside. Besides Fedir Samoilov there was also a lot of other strong climbers in Istria this weekend. In Mišja peč Saša Vidmar smashed the crimpy classic Sonce v očeh while Katie Lambert climbed the endurance beauty Ptičja perspektiva (both 8a+). On the men side in Mišja peč, Slovakian Tomas Plevko fired Marionetta (8b/b+). 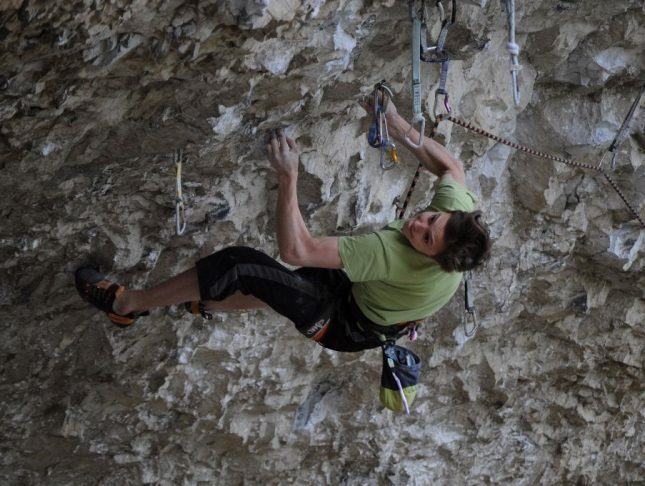 In Croatian Istria, more specific in Kompanj another Ukranian Oleksander Zilinsky redpointed Rainini (8b) and in Kamena vrata experienced Matej Sova did the 1st repeat of Klemen Bečan’s short and powerful route Zvuči teško (8b) in just three tries. The weather forecast for the next week looks optimistic, so there will be more news to come for sure as well as some interesting interview and more. Stay tuned and keep on rocking hard!